21:00 – 22:00 Concert of the U.S.A.
1. Report of our activity in the last two years. 5. Arrangement of the CWA fees. 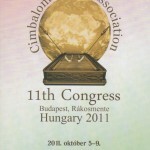 14:30 – 14:50 „The Cimbalom in Greece”. Presentation by Klearchos Korkovelos (Greece). 18:30 – Final concert, closing ceremony. All participants collaborate.